On 19 April 2013, Central Saint Martins College of Art and Design (CSM) MRes Art: Exhibition Studies organised a symposium titled ‘Artist as Curator: Collaborative Practices’ at the Whitechapel Gallery. ‘Artist as Curator: Collaborative Practices’ was dedicated to the discus­sion of artists’ collective engagement with exhibition-making in recent years. Speakers addressed different approaches to curating that have been catalysts for cultural and artistic activity in their locality. The symposium followed and responded to the Afterall ‘Artist as Curator’ symposium (CSM, November, 2012) and reflected further upon the ‘artist as curator’ as a role that troubles traditional conceptions of exhibition-making. If we are to assume that exhibitions are the principal space where art meets its publics, and the key manner through which contemporary art is mediated and experienced, might we posit that artists, rather than curators, have been responsible for the expansion of the notion of exhibition? Or is it the crossover between the two roles that has encouraged the development of collective work structures? What are the modes of production that have changed the way we conceive artistic practice and curatorial discourse? Is collaboration one of these modes? And are there differences between interaction, participation, col­lective actions or simple engagement? How do these terms affect our conception of artistic identity, authorship and responsibility over the work produced? These were the questions the symposium set out to investigate. 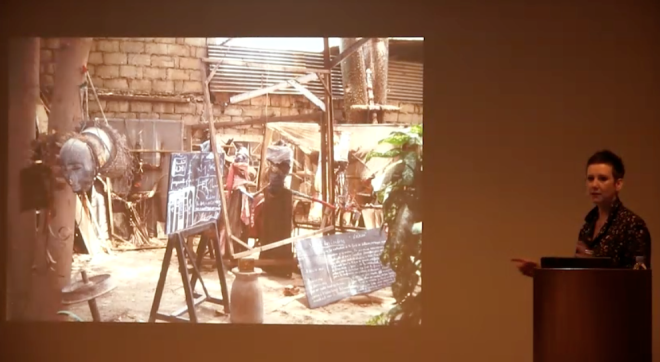 After an introduction by Ambra Gattiglia outlining some possible motivations for artists working collaboratively with exhibition-making, Clémentine Deliss spoke about her involvement and experiences with artists and artists’ collectives based in Dakar. Addressing the period 1992 to 2002, Deliss asked what models might be pertinent to write the history of this time considering the sometimes positive results of slippages that can occur when interpreting visual documentation, and the biographical and historical value of personal accounts. In the second session Liu Ding considered two exhibitions he has curated in the past two years: ‘Little Movements: Self Practice in Contemporary Art’ (co-curated with Carol Yinghua Lu, OCT Contemporary Art Terminal, Shenzhen, China, 2011), and the 7th Shenzhen Sculpture Biennale tilted ‘Accidental Message: Art is Not a System Not a World’ (co-curated with Carol Yinghua Lu and Su Wei, Shenzhen, China, 2012), presenting an in-depth reflection of his practice as both artist and curator in China today. In the final talk Ines Doujak and Oliver Ressler, spoke about their upcoming exhibition project at Secession, Vienna (September–November 2014), where they will invite artist-researchers to communicate their curatorial practice and political engagement by presenting the works of others, before introducing their individual approaches to curatorial practice. The day finished with a round table discussion chaired by Pablo Lafuente, focusing on the impulse to self-organise and work collaboratively in relation to the practice of art and exhibition-making. The question of naming these practices and the possible pitfalls of such classification was also raised. In these pages you can watch videos of all the talks and discussions with the invited speakers. To view the videos please click through the numbers above the image. The event was organised by MRes Art: Exhibition Studies at Central Saint Martins College of Art and Design, in association with Afterall and the Whitechapel Gallery, and with the support of the Austrian Cultural Forum, London.